(Nanowerk News) Malvern’s new Zetasizer Auto Plate Sampler (APS) is designed primarily for protein specialists, delivering fully automated protein and nanoparticle size measurements using dynamic light scattering (DLS), for improved productivity. Unlike other systems, the Zetasizer APS does not require micro well plates to be flat-bottomed or have specific optical properties. 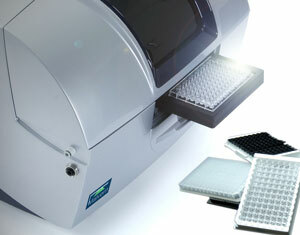 A unique sample handling process makes it compatible with virtually all commercially available microwell plates. Automated measurement procedures using industry standard 96- or 384-well plates enable users to simply insert a sample plate and press "start". The Zetasizer APS delivers accurate and repeatable protein size and molecular weight data with no compromise in data quality due to automating the measurements. Only 20µl of sample is used, and this is returned to the same well for use for other characterization techniques. Programmable dual temperature controls maintain optimal conditions for samples in the well plate while enabling automated temperature trend measurements for melting point determination, protein purity or shelf-life investigations for example. DLS data can be used to solve application problems in bioprocessing, drug target development and protein therapeutics. DLS measures the thermal diffusion of proteins and nanoparticles in solution, and uses this property to determine an absolute hydrodynamic size. This technique is especially sensitive to the presence of aggregates, and their proportion as a function of solvent and buffer conditions can also be determined, speeding development of the protein's optimum environmental conditions.